First of all, this post is not a “scientific post” on the sun and sleep, but if you want that, I have written one found here: Regulatory Sleep Systems. This post is a lot more simple than that one (whew!). This is an anecdotal post about my family and how the sun affects our sleep. 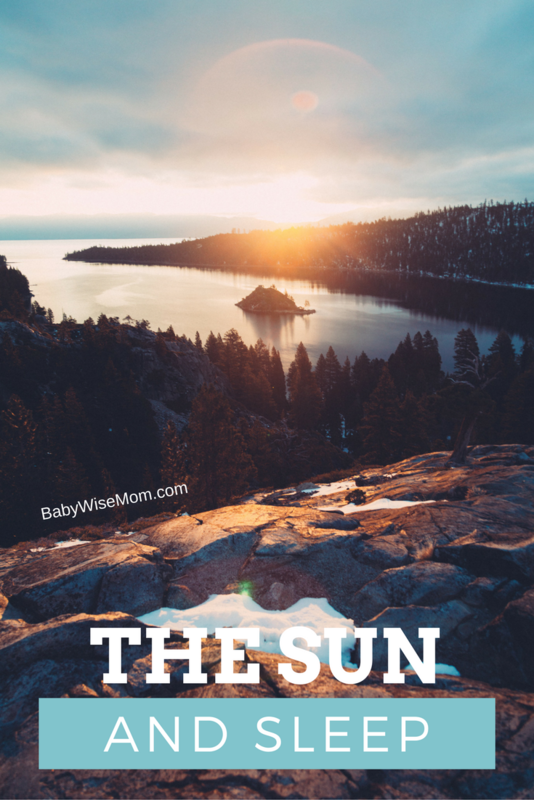 My hope is to get you thinking about the many possible affects of sun on your family so you can do what is best for each individual with naps and bedtime. The first and most obvious reaction with sleep and the sun is “no sun allowed” while sleeping. Some of us are what I call “sun risers.” This means that when the sun is up, we are up. I have always been this way since I was a little girl, and I am still this way. My parents were not structured, so I was allowed to get up when I got up and I got up at 6 AM every day. Being a sun riser is great when you want to get up early–but can be hard when it is the longest day of the year and the sun is gracing you somewhere around 4 AM. It can be hard to sleep unless you have blinds to help block the light. Brayden is also this way. He has always risen with the sun–even as a brand new born. I remember one time when he was two years old and he threw up in his bed in the 3 AM hour. My husband just happened to be working over the night that night, which was a very rare occurance. Kaitlyn was a newborn, so of course sleep was precious to me. Oh, and it was summer. So there I was in the 3 AM hour, cleaning Brayden up and changing his bedding. And not only that, I was racing the sun. I knew without a doubt that if I did not get his bedding changed and him back in bed before that sun came up, he would be up for the day. That was one loooooong day. In present day, if Brayden ever happens to sleep past time to wake up, all I have to do is open his blinds and he wakes up within 30 seconds. Winter is the only time of year he sleeps in because that is when the sun is up late. How are we “sun-risers” impacted by the sun and our napping? In my best estimation, the sun doesn’t really matter for naps most of the time. I usually left blinds open or at least partially open for Brayden, and when I am napping, the presence or absence of the sun doesn’t really impact my sleep either way. For some people, the sun has basically no impact on sleep. My husband is this way. The sun coming up does not in any way wake him up. Kaitlyn is also this way. An interesting thing with Kaitlyn is that she naps much, much better if she has some sunlight in her room. I was closing her blinds–dark blinds that help block the sun–for her naps and she was not napping well. One day I left them open and she took a great nap! So I started experimenting and she consistently sleeps better if her blinds are open. I do tilt them so the sun can’t shine directly on her, but it is bright in her room when she sleeps. You might be curious as to where McKenna falls in this discussion. The truth is, I am not positive. As a newborn, she did not nap well with blinds open. She needed them shut. So ever since then, I have done shut blinds for nap and night. I do know she is a sun-riser. What I don’t know is how the sunshine impacts her napping. In thinking about this post, I decided to crack her blinds a bit for her nap to see how she does. I though there is a possibility that babies need darkness but toddlers do better with some light. She is sleeping right now, and it will take some time of experimenting to get a better idea. The take away for you from this post is to make sure you experiment with your children. Some need to go as far as black out blinds or curtains to sleep well at night and for naps. Others sleep fine with light, and some even better with some light for naps. Do some testing to find out what is best for your child. Previous Post Love Language: Why Be Multi-Lingual? We love blackout curtains at our house! My kids get too stimulated otherwise, especially for naptimes. Thus, sometimes we have a hard time getting good naps out of them if we're staying at some else's house. Our daughter (22 mos) has been napping in our walk-in closet since she was about 6 mos old. We keep a mattress & blanket in there just for her. It's great to be able to pull the door closed and have instant darkness – she falls asleep right away. ODs, My opinion is it is better to have her sleeping really well for the 98% of the time she is in that sleep environment than to sleep okay 100% of the time. You can't always provide that environment, but you will most of the time. And as she gets older, she will most likely be less sensitive to everything. Update: baby turned 3 months on the 20th and today I layed her down in her basinet with out the black out curtain – she went to sleep quickly! We just returned home from a two week vacation, and it seemed like about halfway through the trip she was all of the sudden less sensitive to the light.I'm so excited about this :)Off topic: which of your blogs talk specifically about when to extend babies day time feedings? I read something before, but now am having difficulty finding it. Thanks in advance!! !